Too soon did our snowmobile drive come to an end, and I had to get off my own shiny black vehicle and be okay with that. It took me a while to realise I had actually driven a snowmobile through the Finnish taiga, and everything had gone smoothly, and I hadn’t made any crucial mistakes that resulted in my Mum and me disappearing into fresh snow (which did happen to a couple from our group! ), and we’d make it safe and sound to the end of the tour. 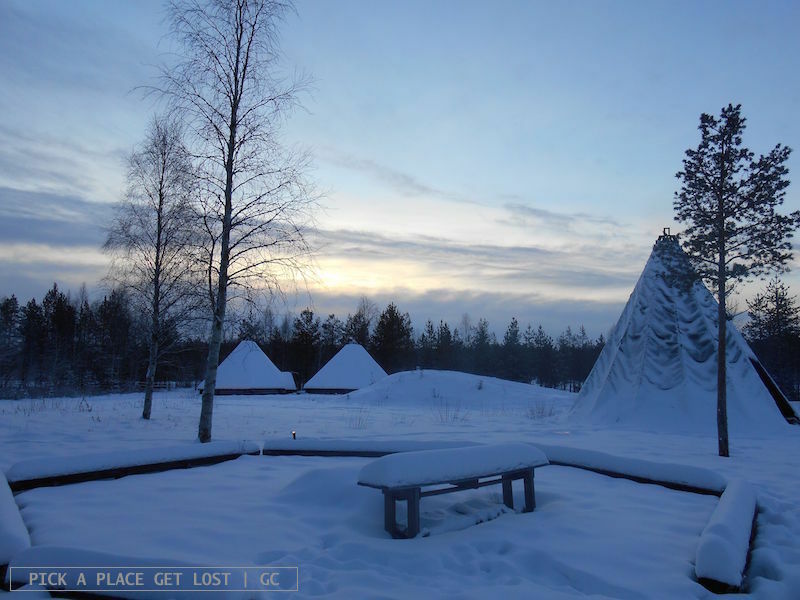 As we returned our helmets to the guides, we diligently marched down a snowy path that led to a snowy open space with a few wooden fenced areas and a large Sami tent. ‘Oh my God that’s so utterly beautiful and amazing’, I said to myself as soon as I could appreciate the vastness and whiteness of my surroundings. Again, it took me a while to fully grasp the beauty and uniqueness of the landscape, where more bare trees looked like they’d been pencil-drawn by a kid, and the whitish light of late morning made everything glisten. My moment of bewilderment was abruptly interrupted by one of the guides, who solemnly stated that ‘Off we go now!’. 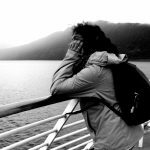 There’s a reason I hate package tours. I can’t quite tell how or why, but I found myself alone with Giulia, and with her little friend and her mother (who also joined us on the trip), while my Mum was elsewhere in the area with Marti and my sister (who, needless to say, also joined us on the trip). The guide showed us and other people from our group to a tiny little wooden house in the woods. We diligently followed them (again, not sure why, but right then that looked like a sensible thing to do – plus, they weren’t too happy about group members not obeying their orders) and went in. 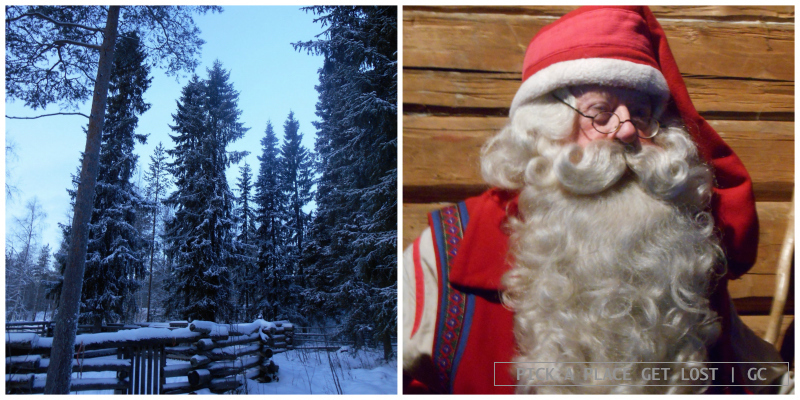 It was one of the cosiest, warmest rooms I’d ever seen, and sitting on a wooden bench was… Santa Claus? Again? I really thought the overall amount of Santa-related stuff I had collected in the previous hour or so would be more enough for a lifetime. Under normal circumstances I’d have probably gone straight for the door handle, and fled. But hey, I HAD JUST DRIVEN A SNOWMOBILE, which meant everything was perfect and great and yaaay. So I stayed, and went along with the zillionth Santa meetup, and it was actually nice. In fact, it was very nice. The kids went over to him one or two at a time, and took (more) photos with him. I managed to stay out of the photo by volunteering to take photos of Giulia with him, and then of Giulia with Santa and her little friend. All in all, this ‘intimate’ encounter was so much better than the ‘official meeting’ at Santa’s official residence. Enough with the Santa stuff now, though, I want more taiga. 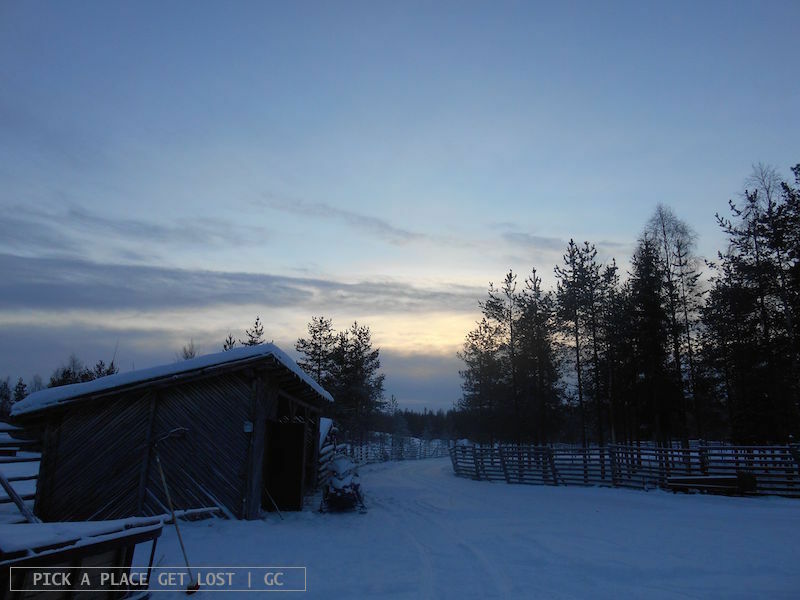 After leaving Santa’s cabin, we went back to the open space with the Sami tent, where we learned we’d be going on a sleigh tour with reindeers. And of course I love reindeers. We took turns, as there weren’t enough reindeers for everyone (! ), so Giulia and I volunteered to wait for the last round, and so did Mum and Marti. 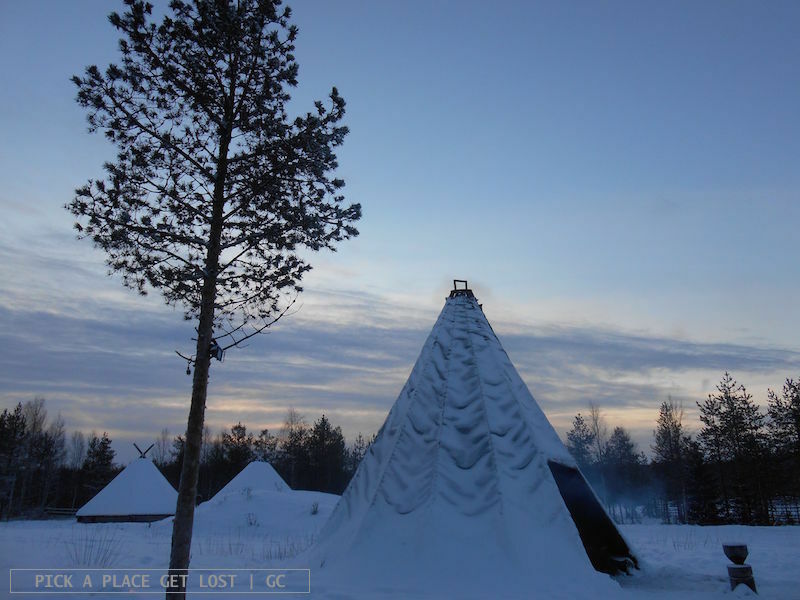 Instead of waiting in the cold, we visited the Sami tent, which turned out to be a round-shaped oasis of warmth and cosiness. There were wooden logs that formed benches for guests, a central roundish area where bonfires were probably lit at night or when it was particularly cold. And there were tiny little paper cups neatly placed on a low, wooden table, filled with three different flavours of hot tea. They were all equally delicious and heartwarming. I think I had three cups of each flavour, and still counting. Thankfully, at that point we were summoned for the tour, which turned out to be one of the sweetest experiences I’ve ever had. Our reindeer was Thomas, a lovely, funny-looking reindeer with the softest, warmest look. I’ve always liked reindeers a lot, but really, after meeting Thomas in Lapland (which, the way I worded it, sounds like all but a sleigh tour with a reindeer – but really, I’m still talking about the reindeer) I like them even more. The sleigh ride lasted for some 20-25 minutes, during which Thomas clicked his feet as if to some rhythm only he was familiar with. Apart from that, and the imperceptible sound of the sleigh being dragged on the snowy ground, all was utterly and completely quiet. And white. It was ‘qwhite’. And stunning beyond words. Every now and then the reindeer from the sleigh behind ours (whose name I don’t remember) would catch up with us, and walk a few steps next to us. At some point he noticed Giulia and me sitting in the sleigh, and bent over as if to look at us closely. He was so funny and beautiful. Giulia was scared he would hurt us, but really, she loved him too. Even today, she remembers that reindeer very well, and sometimes she asks me if I also remember ‘the reindeer that got so close to us while we were dashing through the snow in Lapland?’. All in all, I’m well aware that, of all the things I did on that day (and there was a whole lot of them), most of them were arranged specially for us, and lacked the somewhat ‘authentic feel’ I like so much about things. Still, in the case of the snowmobile ride and of the sleigh ride with Thomas I’m more than willing to make an exception. 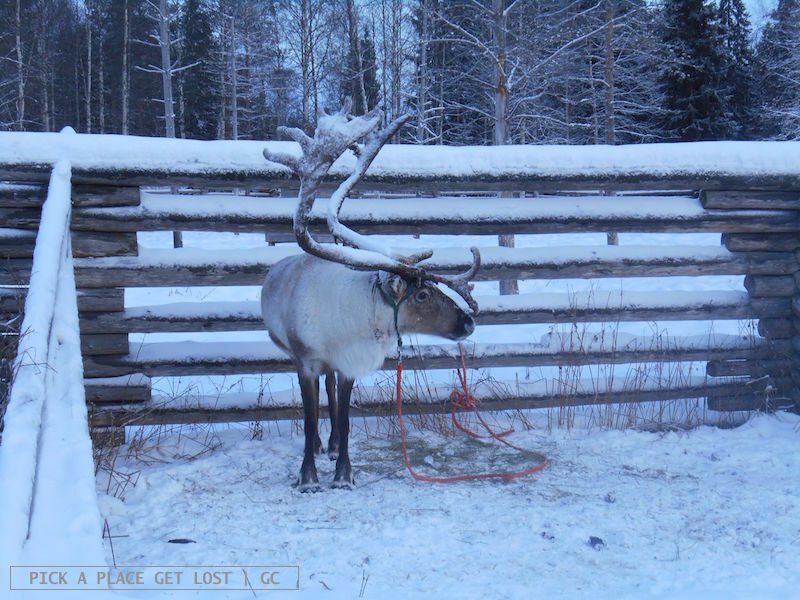 This entry was posted in Finland, Lapland 2013 and tagged lapland, rovaniemi, santa claus, sleigh, snowmobile, thomas reindeer by Giorgia. Bookmark the permalink.